NEMT has continued to celebrate its partnership with the Customs House by setting up an extra attraction at this year’s Knitted Victorian Christmas show which then moved to a Harrogate Show on 25 to 28-November. This included making the basic frames, a sleigh, fully working grandfather clock (which kept perfect time) and reindeers. Also included was the making of wooden plinths, numerous stretcher frames and setting up of the South Shields gallery shows “Grand Tour” of Salma’s Dream. The knitters had formed their own group called ‘The Materialistics’ and NEMT was well represented too, with prime position given in the foyer of the grand hall. On Sunday when it was time to pack up, the snow started and there was about 4inches in a couple of hours. Everything was grid locked and Harrogate had come to a halt. In fact we were even offering hire of the sleigh to get home!! Everything had to be broken down and carried across a main road through the traffic and snow to our van which was driven by Tim West. It was an epic journey home….what should have taken 2hrs became 5 and a half. 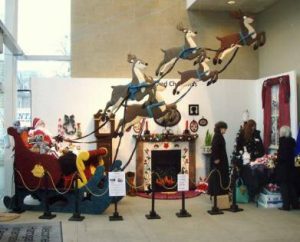 The Sleigh and Santa then had to be reinstalled into the Customs House shop the next morning and it’s on show there till next year. 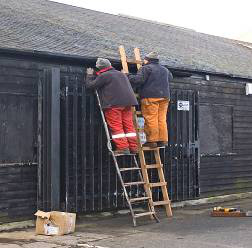 Property Repairs – Not the most popular of jobs, but everything else depends on keeping the workshop in good condition. The roof gutters have been in very poor condition for a long time but Tim West and Arthur Hamilton have been leading on overdue repairs. This follows work which was carried out a couple of years ago to seal leaks but time had taken its toll. Tim and Arthur have now removed the troublesome old sheet metal rainwater goods, which have been replaced with new plastic materials fixed in time for the winter weather (good timing). Work continues, with a lot of unseen work going on. Tim West has been preparing extensive administration and planning schedules of the work, seeking potential suppliers, estimating the time needed and finally looking at where to source the funds required. Arthur Hamilton has been checking the list of steelwork looking into material costs and getting estimates. One outcome has been the production of a very smart fundraising leaflet to inform everyone of our scheme. We hope this will encourage the public to put their hands in their pockets and help finance the project. Tim’s document will also act as an introductory piece when approaching grant providing bodies. The rudder was recently stripped down and then the stern whaleback removed. The latter was a difficult job as it had been built in situ and the fixings could not be withdrawn without damaging the planking, so all screws and nails had to be cut through between the faces of adjacent timbers, a very slow and careful task. This was completed successfully so that the whole unit is now on the workshop floor. The drop keel housing and keel were also removed, hard and heavy work. Brian Fenwick has continued with the work of stripping out and cleaning the inside of the hull, carefully removing defective components for manufacture of replacements. Work started under the forward deck and has continued back to the fuel tank area. This is no easy job, being very confined in places – far from comfortable – but necessary. Charlie Lowdon and Peter Waugh have been concentrating their efforts on replacing defective timber on Spring Tide. The keel has been removed so that some bottom planks can be replaced and new timber has been inserted in the lower stem. This little salmon rowing boat from Whitburn is rapidly progressing towards a successful completion of the woodwork element. Sovereign entered Fred Crowell’s boat shed (next door to ours) in the summer and extensive restoration work has been undertaken in the last few months. Work started with the hull which suffered from loosening of planks. The keel was found to be flexing at a scarf joint, causing a lot of movement over a large area. This has now been repaired and the whole keel fitted with steel bottom and side plates. The rotten rudder shaft has had to be replaced. The hull planking has been re-nailed with nearly 2000 new spikes, several planks replaced, joints caulked and filled. The tops of frames near the stem suffered from worm infestation and new ends have been scarfed on. Damaged areas of deck have been replaced. The old engine has been removed for replacement by a newly overhauled one of the same type (a Gardner 6LW). The gearbox off the old engine has been dismantled for reassembly onto the replacement; quite an extensive job and nothing like the simple arrangement on an automotive application. New fuel tanks have been manufactured to replace the old leaking ones. The above is just a very brief description of the work that has been done to bring the vessel back to good order and more is to be done over the winter. The project has been hampered by the failure to secure an expected grant from one of our national organisations. Fred has gone to great lengths to find ways of making the job achievable in spite of major funding problems. Materials and methods have been changed to make the works possible with the minimum impact on quality or appearance. 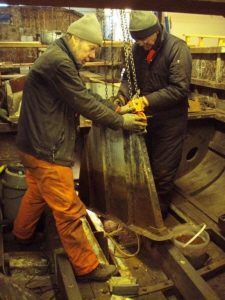 Fortunately the National Historic Ships Committee contributed an emergency sustainability grant for the hull work and the Port of Tyne Fund came to the rescue with sponsorship to make it possible for the boat to work again by supporting the engine replacement. 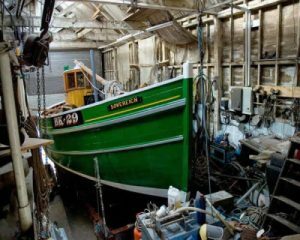 Beyond these supporters, the vessel has relied on funding from the trustees of the Northumbrian Fishing Heritage Trust, who are all NEMT members. It is hoped that Sovereign will be ready to tour events before the summer of 2011. Welcome to our August newsletter which is packed with NEMT’s latest information. Also please check the new headings of Soundings which looks at current and Waypoints for future developments. It is always a pleasure to write about the progress and hard work made by our band of Friends and supporters who are so important to NEMT, without you, we would not exist. NEMT is proud to be associated with Australia and Norway, aiPotu and the unusual sight and shape of the boomerang boat which is now on show at Wapping Street. The Boomerang Boat was made at the 16th biennale of Sydney 2008 by artist duo aiPotu and consisting of the two Norwegian artists Andreas Siqueland and Anders Kjellesvik, who restored the boat and searched for a suitable home in Scotland, Wales and England including the Newcastle area. South Shields became a natural point of departure for them. Going by coast, a series of possibilities were investigated. 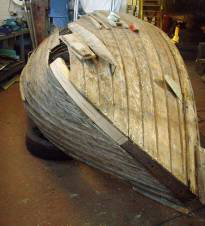 But they just kept on coming back to North East Maritime Trust, a place ‘where we just love old boats’ and did not need much time before the Trust decided to take on the responsibility of creating a new home for the stranded vessel. 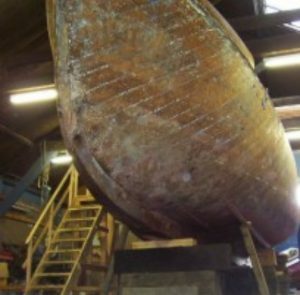 While the boat is definitely very unusual, it has a more serious, relevant history and build using traditional skills now in decline, even down-under. Off to Hartlepool’s Tall Ships Festival, 6thAugust. RD II has successfully undergone full restoration over the last year and looks wonderful in her traditional colours. This Heritage Lottery funded project was also supported by International Paints with open days and public donations also helping to raise the crucial finance required. We wish to express thanks to everyone concerned. A booklet outlining RD II’s full history and restoration is also available, just ask. Funding for the trip to Hartlepool was provided by the Community Area Forum South Tyneside. Shown from right to left; Rachel Douglas, Favourite and Royal Diadem II on their way to Hartlepool. The North Shields Lowlights and Highlights are clearly shown almost in line and just above Royal Diadem II. Tide and weather conditions created a very ‘interesting’ trip with a reasonable swell proving the value of well made traditional boats. NEMT vessels were the only traditional working boats to represent Tyneside and Northumberland at this festival. The festival was a great showcase for NEMT and we made full use of our position which was located at the marina near shops, cafes and a pub too. It is estimated that over five hundred people came along to admire our boats, ask questions and make donations. Royal Diadem created a great deal of interest with everyone including fishermen young and old, who gave us the benefit of their memories and history of local fishing traditions. Our outward and return journey were each completed in about four hours with rather unsettled conditions to contend with. Rain and a big swell helped the tall ships away and us too, but that was no problem for our hardy sailors who took it all in their stride, after finding the end of rope! Favourite and Rachel Douglas at the festival (Click on image to enlarge) . Education for young and not so young is a very important part of what we are doing at NEMT. To take this forward, Tim West has approached over seventy local schools leaving booklets which give an overview of North East Maritime heritage and lifestyles. It also explains what we are about while emphasising the Royal Diadem11 and Henry Frederick Swan restoration projects. Lifeboat ‘Henry Frederick Swan’ is about to take centre stage in our restoration program. This National Historic Ships registered vessel, which is included in the Historic Fleet Register number 2047 is important to our local maritime history. She is also recognised as the longest serving UK registered lifeboat and was one of the first self righting, sailing, pulling (rowing) and motor driven lifeboats of her time when put into service in 1917. Work started before our current restoration projects and included the careful cataloguing, photographing and removal of hundreds of items, engine, fabric floatation boxes and fittings etc. Internal and external cleaning of the hull which also included the removal of nearly 100 years worth of paint and grime was also essential, to allow Fred Crowell access for the preparation of a full condition survey. This has now been completed, ready for a costing survey to start in August. Friends are central to NEMT’s success and very important to our healthy future. Progress, a busy workload and change of administration have all helped to delay our request for membership renewals this year. Therefore, we are changing the membership renewal date for Friends to the 1st October each year. This will be pro-rota for new members who join NEMT throughout the following year. The new ‘Friends’ secretary will be writing to all members in the near future. For example, someone who joins NEMT Friends in April will pay just £5.00 until 1st October when the full £10 annual fee will apply. We hope this new and simplified membership will help to streamline the membership scheme.